Allied Group Of Education Abu Dhabi United Arab Emirates. 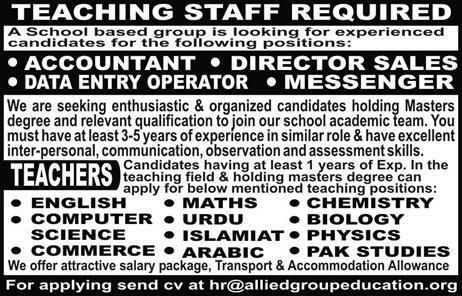 We are seeking enthusiastic & organized candidates holding Masters degree and relevant qualification to join our school academic team. You must have at least 3-5 years of experience in a similar role & have excellent interpersonal, communication, observation and assessment skills. Note: We offer an attractive salary package. Transport & Accommodation Allowance.